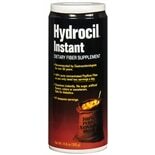 Shop Hydrocil Instant Dietary Fiber Supplement (10.6 oz. )10.6 oz. $1699$16 and 99 cents$1.60 / oz.